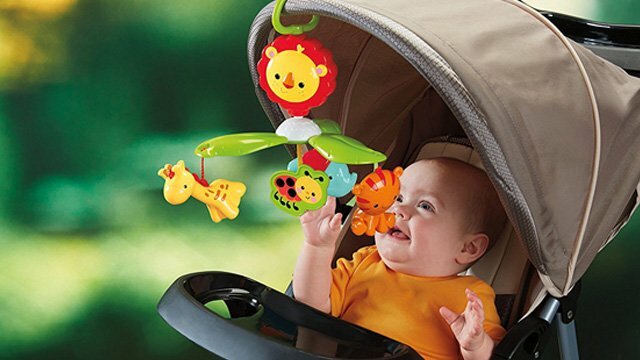 These toys are sure to help your baby hit key developmental milestones month after month. 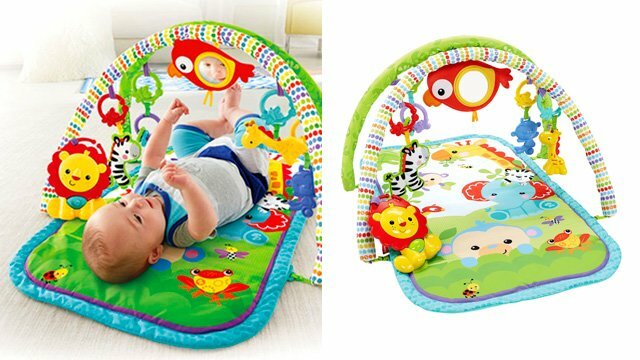 For your little one, playing isn't just a way to pass the time between feedings and naps. It's one of the best ways for babies to explore, learn, and grow. 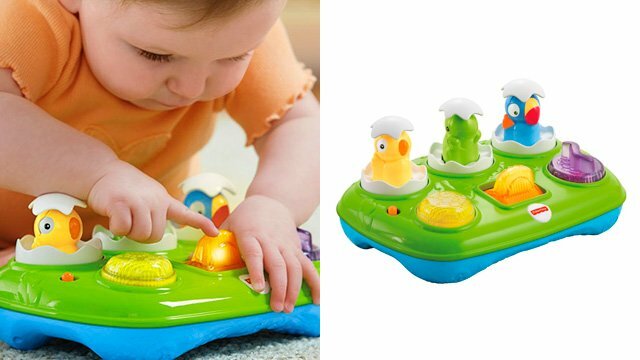 Toys are great tools in helping them reach important milestones. Their cute reactions to and interactions with their toys are just as priceless! Your one-month-old is adjusting to seeing the great big world outside your womb. 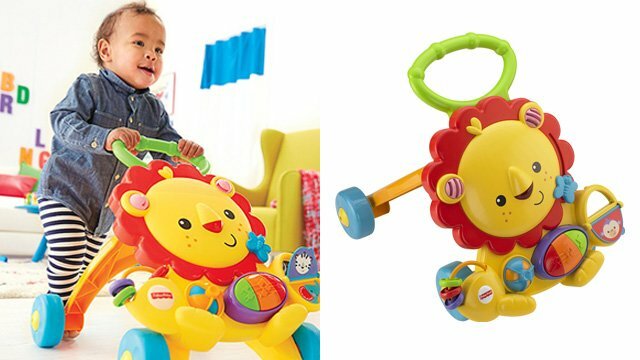 You may notice him starting to stare at boldly colored or patterned objects, so a cute mobile with varying patterns and textures is an ideal toy that will grow with him. Your newborn may already start seeking comfort in familiar faces and objects—sucking his thumb or stopping his cries when he hears a comforting voice or sound. This cuddly seahorse is perfect for snuggling and makes an awesome nap-time buddy, too. At three months, your little one may already be exponentially more active even while lying on his back—batting and swatting at dangling objects, opening and closing his hands, and showing increased focused on toys that capture his attention. A musical gym, with all the various things he can pull and swipe, will provide endless entertainment. Your baby may show an inclination for reaching, grabbing, and gripping objects and toys at this age, so bring on all those rattles! 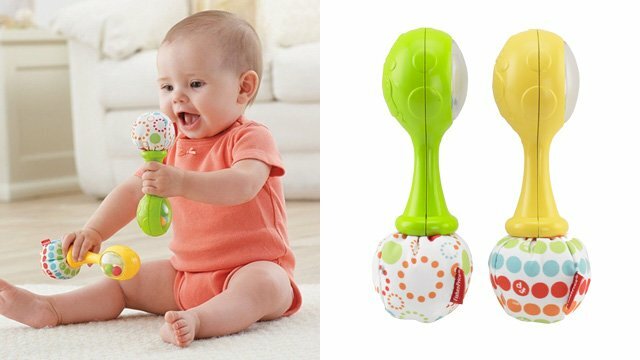 Colorful maracas are multi-sensory—imagine how fascinated she will be when she hears their sound and sees their colors. Despite still being largely immobile, your baby can already entertain himself for brief periods of time at five months old. 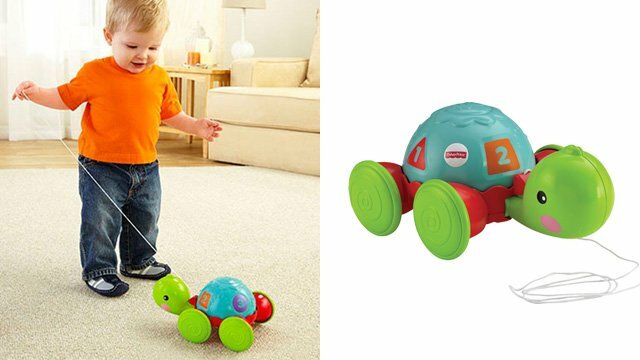 He may explore toys within reach, roll over a little, and focus his attention on colorful things. This Kick & Play Piano Gym will keep him occupied, for sure. 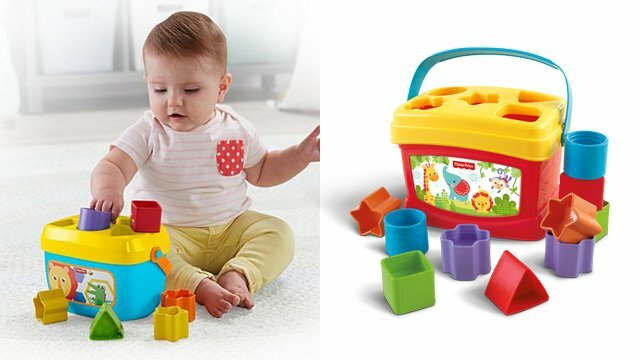 Your six-month-old may already be sitting unaided at this point, and may already master using her hands to manipulate toys and objects (like pressing or passing from one hand to another). Encourage this motor skill with pop-up eggs that will pique her curiosity. At this stage, your baby will love the stimulation of toys she can manipulate—these classic stacking rings are a prime example. She may also already be into playing peekaboo, looking for partially-hidden objects, and even dropping or throwing things, so be patient, mom! Your little crawler and solid-food-eater sure has come a long way! At eight months, he may already be mastering an important motor skill: the pincer grasp or grip, where he holds smaller objects with his thumb and index finger. Cultivate this with a fun book he'll love turning the pages of. Experts say that this is the age he'll start playing favorites with his toys, so why not introduce a sure winner? This box of blocks teaches him stacking and sorting, plus colors and shapes. It will come in handy for months to come. A lot of babies take their first steps around this time, or pull themselves up to standing, at least. This classic walker is a trusty buddy in seeing this milestone through! 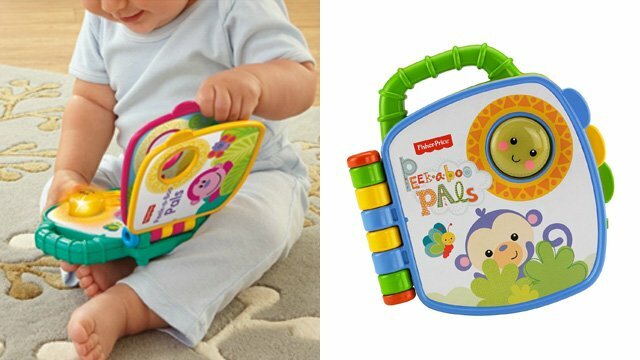 Your baby may now understand more complex concepts such as object permanence and cause and effect, so toys and games that offer both are sure to excite him. He is now into anything that moves after he manipulates it, so consider this play wall an early first birthday present. It seems like only yesterday when you held your newborn baby! Now he most likely can recognize and attempt basic skills and gestures like brushing teeth and waving goodbye, as well as walking unaided. 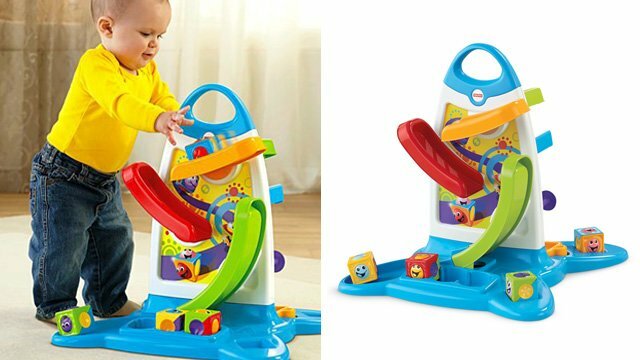 This pull-along toy is sure to make taking those steps all the more exciting and fun! 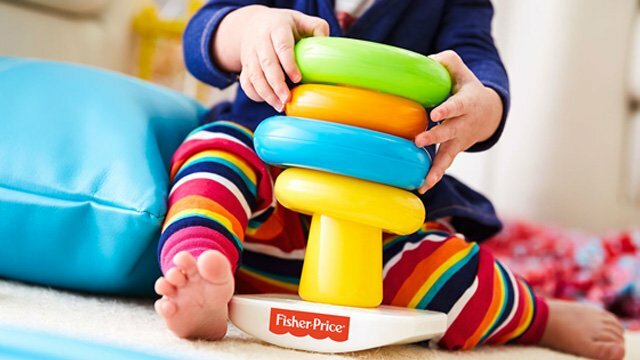 Fisher-Price toys are available at Kids Company and in leading toy stores nationwide. Listed prices are effective until December 31, 2017. This article was created by Summit StoryLabs in partnership with Fisher-Price.